NEW BRITAIN - In a video posted to the VH1 Save the Music Foundation Facebook page, Alice Bidoae, an eighth-grader at HALS Academy, and a friend play a multi-insono. Bidoae made the instrument herself. Part of it provides percussion, the other part the sound of plucked elastic bands. “This allows me to layer two different sounds in order to compile a song just like (famed guitarist and guitar designer) Les Paul,” Alice said in the video. In December, Alice was named the winner of the foundation’s national Les Paul Legacy Contest. What did she win? A Les Paul Epiphone electric guitar and amplifier for her school. Over the last four years, the foundation has given New Britain schools over $300,000 in instruments. 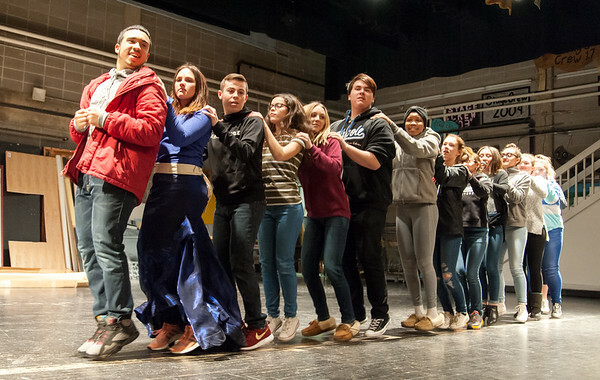 “They realize the importance the arts have in New Britain,” Paul Salina, chief operations officer for the school district and former band director at the high school, said. Although New Britain gained renown as the Hardware City, the arts are embedded in its history. “It was an industrial town, obviously, but those industrialists who owned those factories were really in tune with the arts,” Salina said. Walnut Hill Park and the Darius Miller Bandshell were both funded through the philanthropy of city industrialists. All the schools built early on included auditoriums. The high school’s Golden Hurricanes Marching Band was among the first marching bands to play during football games when it formed in 1935. This innovative thinking, tied with the marching band’s tradition of maintaining its high-stepping, military style has gained the band a reputation outside New Britain. The high school band has 150 students; 100 being musicians and 50 either color guard or baton twirlers. The band has gotten so large that Carlin will have a freshman and beginning band course next year. A wind ensemble, jazz ensemble, and, hopefully, percussion ensemble will also be added. It’s not just the band that has been gaining lots of attention from students, but the choral groups as well. Choral director Jason Ferrandino said the concert choir has 70 students as of right now and orchestra has 42, some of the biggest classes he has seen in years. Due to those numbers, the chorus will be split in two - beginners and advanced - next year. When asked what attributes to the increase of students in these programs, Ferrandino said it has to do with a former superintendent from five years ago who restructured the middle school music department so all students could choose their interests. Students in all K-5 schools in the district take a general art class and music class. By the time they reach middle school, depending on where they go, they can choose how much of music or art is part of their curriculum. At HALS Academy, students get art and general music three days a week. In addition, they can take band, strings or chorus. DiLoreto Magnet School students get a general music course twice a week and have the option to join band, strings or chorus. At Slade and Pulaski, students get the choice of either band, strings, chorus, art or a general music class to take every day. By the time students reach high school, they must complete one credit of a fine arts class of their choosing, which includes ceramics, painting, music theory, stagecraft and drawing, to name a few. They can also participate in courses that also double as extracurriculars, such as band, orchestra and chorus. “New Britain over the years, even when budgets have been severely cut, the arts have maintained,” Salina said. When you walk down to the music suite at New Britain High School you can feel and see a tight knit community of students and teachers in the department. Carlin and Ferrandino both graduated from New Britain High School and participated in the programs they are now directing. “I graduated this program in 2003 and I’m still talking to those same people who were in band and choir (with me),” Carlin said. The special bond between the music students is something much like a support network. When students feel stuck in their academics or need someone to talk to, they have that without pressure. “You come down to the music wing where you have a community here where everybody helps each other out, it’s very socially cool,” Carlin said with a smile. Seniors Robert Breau and Timothy Carrier are both starring in the upcoming musical comedy “The Addams Family,” and have been part of the Madrigals choir for most or all of high school. “The community in the music suite is great. You get to meet a lot of friends and new people. The teachers here you can go to if you’re having problems,” he said. Breau also shared that sentiment. “It’s a lot of fun compared to my other courses, it doesn’t even feel like a class,” he said. While public education has had a big push for STEM - science, technology, engineering and math - programs in recent years, school staff and officials in New Britain are looking at how it can be intertwined with the arts. “We’re all consumers of the arts in some capacity whether its music or art. We all travel, go to movies and listen to music on the radio,” said Leona Clerkin, coordinator of fine arts in the school district. Part of the proposed curriculum at the high school for the 2018-19 school year is a new music technology course. The class will be geared toward students who have an interest in music, but prefer not to perform. They will learn about sound engineering and how to create music electronically. “The music technology is going to speak to this demographic, just given what I’ve seen. It’s something where you don’t need to be an excellent musician to still be creative in music. It’s unique and certainly something that’s a long time coming,” Carlin said. Looking down the line, Carlin said he hopes to also receive funding to create a recording studio available to students. “If (students) are not so successful academically, they’re coming down here and they’re having success, so they have that momentum and motivation (to do well),” Carlin said. Posted in New Britain Herald, , New Britain on Sunday, 11 February 2018 21:59. Updated: Sunday, 11 February 2018 22:02.